Dr. Deepak M. Kalaskar is Lecturer in Nanotechnology and Biomedical Engineering at the Division of Surgery & Interventional Science, and the Centre for Nanotechnology & Regenerative Medicine, University College London (UCL). He is also Deputy Director of postgraduate course in Burns, Plastic, and Reconstructive surgery at UCL. He is the Fellow of Higher Education Academy (HEA), UK, and actively involved in teaching and research in the areas of Biomaterials and Tissue Engineering. 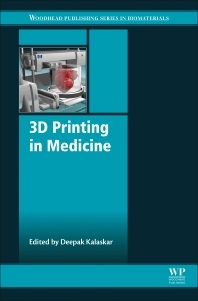 He is part of a working group for the development of a 3D printing platform for medical devices and redistributed manufacturing using 3D printing(RDM-3DP) established by the Engineering Physical Sciences Research Council (EPSRC). He is a reviewer for several internationally reputed journals and editorial board member for several journals in the field of stem cells, 3D printing, biomaterials and nanotechnology. He has previously edited two books and contributed to several invited book chapters in the field of surgery, nanotechnology, stem cells and biomaterials.